Posing with the Captain and the KLM Dakota DC-3. I come from a family of aviation enthusiasts. Hmmm… on second thought, that’s not entirely true. Whereas my father was a true aviation geek and my brother and I share his enthusiasm, my Mum and sister are pretty oblivious, often managing little more than “it was a big/small plane” when asked which aircraft type they’d flown in. As a kid, I spent a lot of time at the observation platform of Subang Airport in Kuala Lumpur, watching and chattering excitedly as planes landed and took off. My Mum would try to tear me away to go home and I would say, “just one more plane… one more!”… and she would sigh (and give in). I didn’t become a pilot (everyone thought I would) but my brother did – I just didn’t find the idea of being cooped up in a cockpit for hours on end quite appealing. That didn’t diminish my enthusiasm for airplanes though. When I’m not in them, I’m watching them from my backyard (I live under one of Amsterdam Schiphol Airport‘s flight paths), armed with the Plane Finder app on my iPhone (so I can check the plane’s origin and route) or from one of the plane-spotting areas around the airport. They never cease to amaze me. 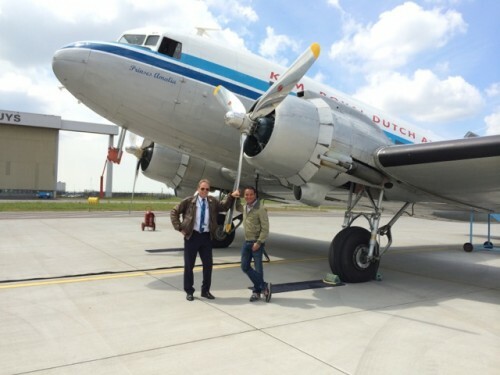 When I received an invitation from KLM Royal Dutch Airlines to experience a flight on a historic Dakota DC3, I literally jumped in excitement. 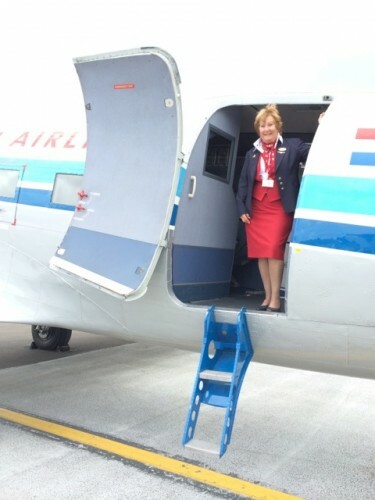 The flight was planned as part of KLM’s 95th anniversary celebrations and I was invited! Woohoo! The Dakota DC-3 PH-PBA in retro KLM livery. The flight, from Amsterdam across the North Sea to Newcastle, turned out to be one of my most memorable flight experiences ever! I flew with a small group of bloggers and we were all heady with excitement when we arrived at the private jet terminal in Schiphol Oost (East). We were welcomed by volunteers from the Dutch Dakota Association – the association maintains a small fleet of Dakota DC3 planes and carries out regular scenic flights around the Netherlands. Everyone, from the pilots to the engineers, flight attendants and ground staff work on a voluntary basis, a true testament to their love for the Dakota DC3. Sonja welcomes us on board. We were briefed about the history of the plane we were flying on and I was amazed. The plane, with serial number PH-PBA, is truly historic. Built in 1944, the plane first served in the US Air Force and was used during D-Day operations in Normandy and Operation Market Garden (to liberate the south of the Netherlands from the Nazis). After the war, the plane was presented as a gift to Prince Bernhard, the husband of Queen Juliana of the Netherlands. He used it as a private plane, flying himself and his family around for many years before passing the plane on to the Dutch state. The plane eventually ended up at the Aviodome, the aviation museum at Schiphol Airport. In 1998, after a lengthy process of restoration, the plane was once more ready to take to the skies. 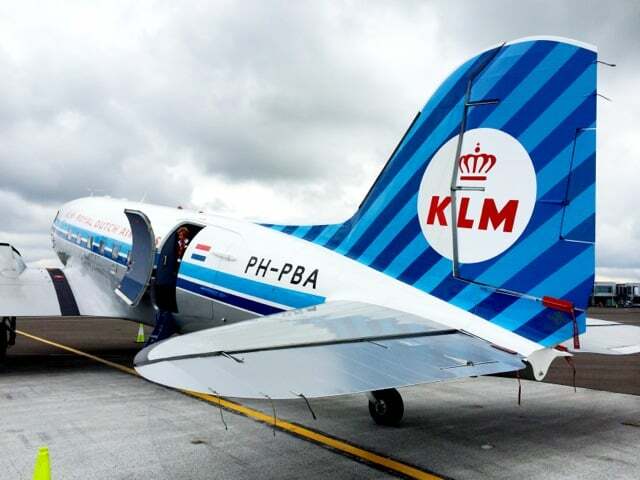 Painted in the livery of KLM (the association’s sponsor and one of the first airlines to add the DC3 to its fleet in 1936), the plane was used for special events and tours, including the recent 70th anniversary of D-Day in Normandy. During the briefing, we were awed by stories of flying in a KLM DC3 in the 1930’s. The plane was deployed on routes from Amsterdam to Batavia (present-day Jakarta in Indonesia), a flight that took several days with multiple stops in the most exotic places. We couldn’t wait to board the plane! We received our boarding passes and hopped into a van that brought us to the PH-PBA. Our captain, Ruud Schoenmakers, guided us around and after countless rounds of photos, we finally boarded the plane. I noticed that we weren’t the only ones who were excited – around the tarmac and the hangars, engineers and other aircraft personnel had gathered to watch us board the plane. It felt like a true honour. We were welcomed onboard by Sonja, our flight attendant, with a glass of champagne. The first thing that tickled me was the slope I had to ‘climb’ to get to my seat (1K) in the front of the plane. The interior, fitted with plush KLM seats, was surprisingly spacious. The door was soon pulled shut and we taxied to the runway. Sonja gave us a safety demonstration and added that the cabin is not pressurised. If we felt too warm or cold, we could let her know; the temperature would be ‘regulated’ by simply opening/closing a window! It was too funny! The engines roared and after a short run, we lifted off like a feather, flying low across Schiphol Airport before heading for the Dutch coast. We climbed to a cruising altitude of about 1,500m, passing ships and oil rigs in the North Sea. Despite the non-pressurised cabin and noise from the engines, it was surprisingly easy to conduct a conversation and hear each other. It also felt more comfortable than the pressurised cabins on modern aircraft. We were free to walk around the plane and visit the cockpit. I watched the captain and co-pilot as they poured over their maps – there was of course no navigation systems! It was a humbling experience to be on board this historic plane, flying across the North Sea; an incredible flight back in time! Watching the pilots navigate across the North Sea. It was a huge thrill to fly low above the English countryside. There were stunning views of the rocky coastline, cliffs, beaches, towns, villages and several castles. After about 2.5 hours, we reached Newcastle where we swooped above the city in a broad arc before making a smooth landing. Enjoying the view of Newcastle through the DC3’s big windows. We exited the plane and had one last walk around this grand dame. I touched her shiny surface and felt a mixture of humility and awe. I’ve made countless flights but this is one I’ll certainly never forget! One last look at the grand dame. And I received a certificate as proof of my flight on board this historic plane! The Dakota Association of the Netherlands conducts regular flights with the Dakota DC3, offering a historic flight experience as well as fabulous views of, amongst others, Amsterdam and the tulip fields due to the low cruising altitude. 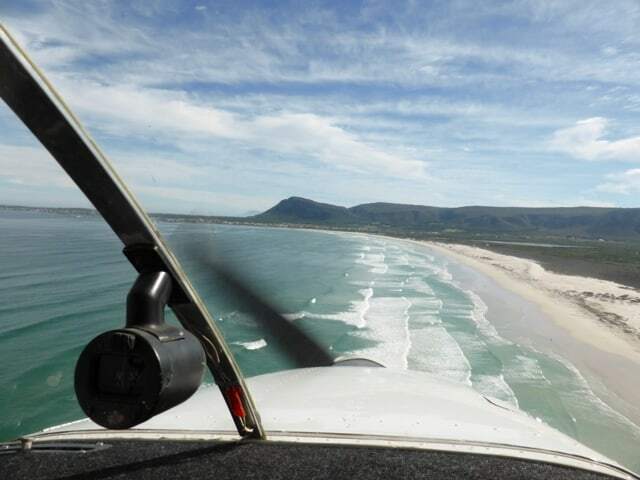 For the aviation geeks out there, this is surely something for your bucket list! Note: a big thank you goes to KLM UK for inviting me on this unforgettable trip! I hope you get to fly on the Dakota again! 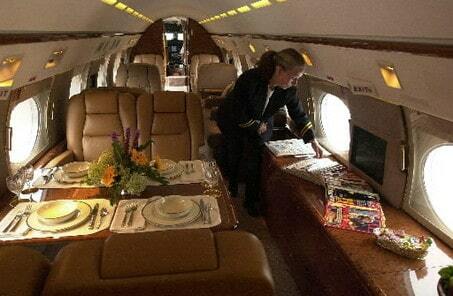 How can I get a flight in a Dakota? I live in north west London, not too far from Heathrow. My first ever flight was in a Dakota in the mid nineteen fifties. Hi folks, if you are ever coming down to New Zealand (where there are lots of nederlander folk living by the way) you must try also a flight in the restored DC3 of Air Chathams’ (ZK-AWP). It was built in 1945 and was delivered straight to New Zealand where it has remained ever since. I, too, just had my first ever DC3 flight about 12 hours ago and I am still in wonder of the experience. The DC3 is a thoroughbred of an aircraft. They are SMOOTH and QUIET and superbly COMFORTABLE and fill you with confidence in the aircraft. You ENJOY every second of flying in it! There is no ‘modern’ aircraft that seems to have this same quality which is hard to describe and quantify. I guess you could say the DC3 is quite simply the Rolls Royce of the skies, of all time. Yes, it was a prop plane. As mentioned in my post, it was surprisingly ‘quiet’; it was easy enough to have a normal conversation in the plane without having to raise our voices. This harkens back to the golden age of air travel. I noticed that it was a prop plane though … was it really loud for you, or was it manageable? I was on a prop plane once, and I was left wishing I took earplugs!